This Guitar Lesson, although it is not extremely complex, it could take your playing into new areas if yo don’t already play this sort of thing; and I’ll just about guarantee that you don’t use these type of things in your improvisation. What I’m talking about here are Double Stops, basicaly you play two notes at a time. Double Stops can sound very musical, are great for improviisation /solos, good for playing a second part behind another guitarist who is playing chords, and also very nice to play sections of songs in solo arrangements. They fatten up the melody line by having a harmony note and require a little more thought than just running your hands up and down the fretboard playing scale notes. I accidentally started playing part of the chorus of old song that people sing on New Years Eve called Auld Lang Syne, so I thought it would be good to use as an example because there is no copyright breach, most people would know it and also there’s a lesson in the fact that you are trying to make something sound musical that you probably would never play. There is an art in this itself, to turn common melodies into something and make it sound great. In fact Alex DeGrassi recorded an album of lullabies, and it’s a perfect example of how to arrange for guitar. Although this is not an example of one, you might like to listen to this Alex Degrassi Youtube Video. I’ve only recently been introdeuced to Christine Kane’s music via the Putumayo American Folk album. Her style is a blend of Folk Country. One song is called No Such Things as Girls Like That, it’s interesting vocal line. The story before the song is very likeable . The other is Right Outta Nowhere. About 15 years ago I became interested in Guitar Making, at the time I went and did a Guitar Construction Course and in my quest for further information I came upon a number of books, one that stood out was a boo by William Cumpiano and Jonathon Natelson called Guitarmaking. It is so thorough I would have to say it has set the benchmark for all others that follow. As guitar players, whether we build, repair or just play guitar, it is worth getting an understanding on what makes a good guitar. Playing scales, learning tunes, recording, giging is all very well but looking under the bonnet is a very healthy thing to do, the instruments you play can make a massive difference to how you play. Getting a bit of an education in Guitar Construction is highly advisable, especially for when you buy a guitar, regardless of price range, being informed is good, you may very well be playing the wrong or looking for the wrong guitar to suit your needs. This is the first time I’ve posted a youtube to this guitar blog that didn’t have an acoustic guitar in it but I couldn’t resist this one with Bela Fleck the contemporary banjo player playing banjo. Bela Fleck has worked with numerass Bluegrass and NewGrass (modern Bluegrass that ventures out a little more) and he has also worked with a number of World Musicians, such as Vishwan Mohan Bhatt. In keeping with my policy at my sites, I’m not going to stick with one style of music because it’s possible to inspired from numerous styles. This version of Mediteranean Sundance played by Al Di Meola Paco De Lucia John McLaughlin is fantastic. I saw them play it live over 20 years ago and it’s interesting to see how the tune has developed over that period of time. To see three virtuosos playing together and there being enough musical glue for each of them to retain their individuality but find a meeting point is a wonder in itself. The only thing better than two guitars is three….in the right hands. 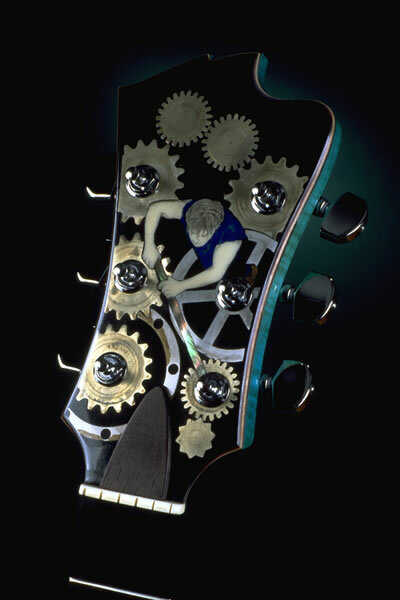 For quite some years now Linda Manzer has been making some of the most beautiful guitars on the planet. A week or so back I wrote a short article about McGowan Guitars and also Olson Guitars. 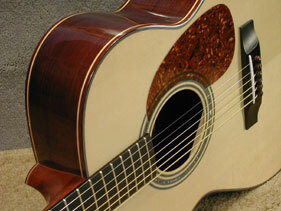 Canada has some brilliant guitar makers such as Laskin and Larivee.